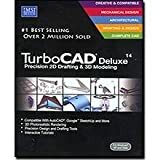 TurboCAD is a CAD software package, that supports 2D and 3D design and drafting (Note: not all versions of the program support 3D). Versions of TurboCAD are available for both Microsoft Windows and the Apple Macintosh, however there are significant differences between the two, as the versions for each of these platforms has been developed independently of each other. 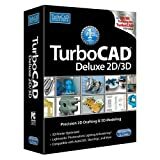 TurboCAD Pro Platinum, TurboCAD Pro, and TurboCAD Deluxe - 2D/3D versions of the software for Windows. Excellent File Sharing with AutoCAD .DWG & .DXF, SketchUp .SKP and read/write of .STL files for 3D Printing and & more! TurboCAD Deluxe continues to be the best solution on the market for new 2D/3D CAD users. It’s easy to learn and use and offers an incredible collection of 2D drafting, 3D surface modeling, photorealistic rendering, and supported file filters. Over 20 new and improved features have been added in 2017. •Complete 2D/3D Design Tools for drafting, modeling, modifying, dimensioning and annotation. •Easy to Learn and Use with set up wizards, context-sensitive help, snaps, alignment aids, and handle-based editing. •Improved Conceptual Selector Tool and New Timestamp for greater usability. •Design Director for object property management. •Easy 2D Drafting and Editing including New Centerline and Center Mark Tools. •Surface Modeling Tools like 2D/3D Booleans, extrude, revolve, sweeps, & more. •Architectural Design Tools including an Improved House Builder Wizard. •Photorealistic Rendering, materials, and lighting to create powerful presentations. •3D printing features with read/write of .STL files, surface simplification controls, and a 3D Print button for 3D Systems printers. •Excellent File Sharing with AutoCAD® .DWG & .DXF, SketchUp .SKP, .TAP files for mobile & more! TurboCAD 2D/3D Basic Training helps users quickly learn the basics of 2D drafting and 3D design using TurboCAD. It offers a range of exercises covering both technical and architectural designs so you can more quickly accomplish your precision design goals. 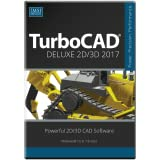 This product, a $50 value, is included free with your TurboCAD Deluxe 2017 download. Smart Dimension Tool - Automatically select the appropriate dimension for the type of entity (i.e. arc, line, circle) being dimensioned. No need to have to go back to the Dimension menu to select a different dimension type each time a different type of object needs dimensioning. Toolbars, icons, and menus function the same way as AutoCAD LT.Dynamic input at cursor and familiar heads up display.Command line, common keyboard aliases, and quick keys.Tool palettes to access common and customizable tools. Valuable Content - Over 38,000 2D/3D symbols and parts are now included for AEC, Mechanical, Electrical, Process Plant and Piping design. Simply drag-and-drop to speed design. Hatch patterns and colors, as well as 2000 materials are also available. 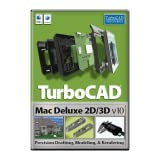 TurboCAD Mac Deluxe 2D/3D is the all-purpose precision design solution. Design with powerful 2D/3D drafting and ACIS modeling tools without sacrificing speed or ease of use. Access libraries of pre-drawn symbols and floor plans. Import and export many common file formats. TurboCAD Mac Deluxe 2D/3D is the complete precision design solution making it easy to design anything. Through a simple interface, use the design wizard to quickly layout floor plans, diagrams, and illustrations. Choose advanced architectural tools for 2D/3D home design or 3D surface and ACIS® solid modeling tools for engineering designs. Online help, video tutorials, and user tips even help you improve skills. Perfect for architects, engineers, designers and more. Quickly model complex 3D objects with advanced mesh modeling, surface modeling, and the powerful ACIS solid modeling engine and file filters. Share Designs with Ease Easily import existing designs from popular CAD and graphic design file formats, including AutoCAD 2016 DWG/DXF. Just as easily, export your precision designs and technical drawings from TurboCAD to other CAD formats, or choose a popular desktop publishing formats to create brochures or other marketing materials. Even print design to your specifications with new easy to use print options. Architectural Tools - TurboCAD LTE Pro provides architectural features you will not find in AutoCAD LT, including IFC import/export, a range of parametric, ACA/ADT compatible architectural objects, a house wizard, architectural style manager, and more. TurboCAD LTE Pro is a full-featured 2.5D CAD software solution with advanced features and extensive file support. Rich in fundamental drawing tools and drawing aids that speed design, TurboCAD LTE offers everything you look for in AutoCAD LT, plus additional advanced features that CAD professionals want, all at a fraction of the price. In addition to providing users with a familiar User Interface, TurboCAD LTE Pro offers a variety of features like a 64-bit version, GPU-accelerated drawing engine, and more, to enhance your productivity.